Kevin Patton: Your lucky numbers for today are two, one, three, zero and six. Aileen: Welcome to the A&P Professor a few minutes to focus on teaching human anatomy and physiology with host Kevin Patton. Kevin Patton: In this episode, I talk about how many genes there are in the human genome. I tell you how to get a free book of Brain Facts and I discuss why students should read A&P terms out loud. Kevin Patton: Two, one, three, zero, six those are our lucky numbers, but what in the world does that mean? Well, it refers to some new research that came out about the number of genes in the human genome. This recent research states that they found 21,306 protein coding genes in the human genome. So, that’s two, one, three, zero, six. Now the reason why this is significant is that the last published data that I’m aware of, of a big study showed that it was somewhere around 19,000, actually little bit over 19,000 protein coding genes in the human genome. Kevin Patton: Now this research ups that number from 19,000 or a little over 19,000 to a little over 21,000. So, that’s a pretty significant job. Now if you’ve been following this at all, you know that over the years, the many years that we’ve been looking at the human genome, you know that the original estimate started out more than twice that number. They been scaled down and down and down over the years and most recently was 19,000. That’s the number that I use in my teaching of human anatomy and physiology, but now maybe it’s looking like it’s a little bit higher than that. Kevin Patton: Now, we need to take this with a grain of salt because well that’s how we do science is that we don’t just throw away our old thinking and adopt new thinking every time a new research article comes out, because we have to think about it a little bit and we have to see if other people can replicate those numbers and compare it to other information that we have out there, but know this could be significant. It might mean that we are zeroing in on the number but we’re going to see some fluctuation back and forth and back and forth a little bit until we really have it nailed down or nailed down as closely as that we’re going to be able to. Kevin Patton: Now the same research said that there were approximately the same number of non-coding genes in the human genome. They said 21,856. So, that’s something like 500 and some odd more non-coding genes than coding genes. They also came up with a total of over 300,000 transcripts that can be made from those genes and so that comes out to an average of about seven and a half transcripts per gene. So, they are claiming that they discovered a bunch of new genes, well over 1,000 new coding genes and almost 4,000 new non-coding genes. Kevin Patton: So, my point here is that well if you want the latest number, its little over 21,000. If this comes up, you might want to mention that we don’t know that number for certain. It’s just the newest number. Maybe we want to stick. I think I’m going to stick with the 19,000. Actually, I’m not going to do that. I’m going to say probably somewhere between 19,000 and 21,000, somewhere in that neighborhood and take just a moment to explain that this is ongoing science. This is an exciting area of human biological research. So, there’s your new numbers, 21 306. Kevin Patton: Hey, have you ever heard of a book called Brain Facts. It’s well described as a primer on the brain and nervous system and is published by the Society for Neuroscience. I’ve been familiar with Brain Facts for a while now, but if you haven’t heard of it, you need to check into this. Kevin Patton: I just downloaded the most recent addition to the 2018 edition. I downloaded it is a PDF file. They actually have two different PDF files. Just a regular one and one that’s a high resolution version if you want to print it out and make it look really nice. As a matter of fact, previous editions are available as audio recording sort of like this podcast and you just go to iTunes U to do that. I’ll have a link to that in the show notes. I have a link to all this in the show notes and in the episode page at theapprofessor.org. The Society for Neuroscience states that this is aimed mainly at secondary school teachers and students, that is advanced secondary school students. I’ll tell you what, my undergraduate college students are really at the level that this is aimed at. Kevin Patton: I think many of them who are interested in the brain would be fascinated by looking at this. It really does summarize the basic ideas that we want them to know in A&P and then it adds a lot of practical applications in various areas of real life and also clinical applications and things like that. So, it really helps students understand why it is that he didn’t know about membrane potentials or neurotransmitters or all those bazillion parts of the brain with weird names that we have them learn, and convoluted functions that seem to overlap one another because they’re all being coordinated together. Kevin Patton: So, even if you’re not going to have your students use it, I think it’s a fascinating read. Not only that, it’s got some really cool pictures. I love the pictures. A lot of those are open resource materials that you might be able to use in your own handouts and things like that or in your PowerPoint slides if you’re using those in your course materials. Before I forget, it’s also got like a glossary and all kinds of stuff in it. So, anyway, I have a link to all this on the episode page and in the show notes. Take a look at it and give me some feedback. What do you think about it? Kevin Patton: Thank you so much for listening to this podcast. I love hearing all the feedback I’ve been getting over the past few months that it’s been running. I get phone calls and in person comments and emails and direct messages and all kinds of stuff, tweets even where people have expressed their appreciation for some little thing that they picked up in an episode that helped them in some little way. Boy, that’s just like teaching, isn’t it? I don’t make any money from this but it just warms my heart that helping people even if it’s in a tiny little way. There even been folks that have volunteered to be interviewed with something that they learned in some way in their own teaching and they want to share it with other people. There are other people who have buckled under pressure to share and you’ll be hearing those interviews coming up soon as well. Kevin Patton: I have a favor to ask you right now though. If I can get you to share a link to either one of the episodes that you particularly enjoy or to the main podcast page which I’ll have a link to in the show notes and at the episode page at theapprofessor.org. If you can share that link with someone you know, maybe you know somebody who’s at a school somewhere where they’re the only A&P teacher, this gives them an opportunity to have another A&P teacher, really a whole group of other A&P teachers in their ear on a regular basis so they don’t feel like a lonely lighthouse keeper out there. Kevin Patton: They’re actually listening to things that have to do with the teaching of A&P or maybe you know somebody in your department or maybe somebody you know through some other part of your network that may be would enjoy hearing about new teaching techniques or different teaching techniques or what’s new in learning science or what are some updates in the science of human biology. So, pick two, just two. Okay, three if you really want to do three. Okay, four if you want to do four. If you could just share it with a friend or colleague or even somebody you don’t know, that would really help me extend the reach. Once that happens, then we’ll get more people volunteering to share what they know on this podcast. Kevin Patton: Hey, I know podcasting is relatively new. There are a lot of people out there who know what a podcast is but when you say to him, “Hey, have you heard this podcast or that podcast?” They have to stop and think, “How would I access a podcast? Where would I go to do that? How do you do that on your phone?” Well, I have mentioned before that I now have these apps. That is absolutely the easiest way to listen. Not only that but you get extra bonus features you wouldn’t normally get in other ways of listening to a podcast. So, why don’t you share that link? Share a link to either the Apple or Android or Kindle Fire apps and all they have to do is go to their app store. They don’t even need the link. Really, just say, “Go to your app store and look for the A&P Professor and download the app and then just start listening.” As always, I thank you for your support. Kevin Patton: I recently ran across some neuroscience research published at the end of last year in a journal called The Memory. It showed that reading information out loud is remembered better than if the same information is read quietly to oneself and it’s remembered better than if it’s read out loud by a different individual. I have a hard enough time convincing my A&P students that it’s a good idea to read their textbook in the first place. So, I’m not sure I can convince them to read out loud. That seems to harken back to those endless hours of reading out loud from the textbook during class in grade school. Kevin Patton: You might remember that when one student stands up and reads a section of the book and then sits down and the next student stands up and reads a section and so on and so on until the entire chapter has been read aloud to the class. That seems a bit too, I don’t know, old fashioned, right? How could it work if it’s old? Yikes, it doesn’t even involve technology. Wait, wait, wait if my students read aloud from an e-book or some other digital resource, then maybe they’ll be perceived as useful because it involves technology. Well old fashioned or not, paper or digital, the research shows that reading aloud helps one remember. Thinking about whether I should ask my students to read their material out loud, that is in private not in class like we did in the third grade, reminded me of a blog post from a few years ago in The A&P Professor blog. Kevin Patton: I had recently written to A&P students about new research that investigated when we read the brain recognizes whole words rather than letter by letter. I suggested that this could be used to help students read and learn A&P more accurately and more quickly. I did that in a post called Reading Scientific Terms at The A&P Student blog. I have a link to that in the show notes and on the episode page at theapprofessor.org. Now, scientists had long suspected that the brain handles reading that way. That is word by word and not letter by letter, but the new research I cited told us where in the brain this happens and helped us understand the mechanism behind the process. Kevin Patton: As we try to help our students learn A&P, it’s useful for us to know about this phenomenon also. As I explain to students, a good strategy based on this mechanism, a strategy long promoted by college reading teachers involves reading the new terms of a chapter out loud before starting a new topic. Even if the student reads little or none of the chapter, this strategy will help them when they encounter the terms in lecture, lab or in handouts or wherever. So, now you see why this newer research on reading out loud reminded me of that earlier discussion of how to best handle the huge number of complex terms encountered in the typical undergrad A&P course. Kevin Patton: How does this out loud method of learning A&P terms work? Well, let’s break it down a little bit. Because when we’re reading efficiently as the research demonstrates, the brain does best when it can recognize whole words rather than having to stop and read the word letter by letter or phoneme by phoneme. A phoneme is a speech sound that a letter represents. By reading and saying the words before reading a chapter, we allow our brains to recognize or own the terms. Even if we don’t know what they mean, we recognize them and our brains no longer stop and analyze them to attempt to pronunciation inside our head. Kevin Patton: Practicing the pronunciation of previously unfamiliar terms aloud, primes the brain so that reading will be faster and more efficient. 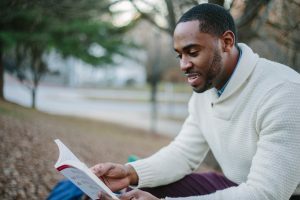 Comprehension of what is read increases because the flow of reading is uninterrupted and because the content of the passages can be put into a framework of terms that already exist as units in the brain’s memory. Presumably, familiarity with word parts helps this process by making the initial reading of terms more efficient. That’s because longer words that is really long scientific terms are usually made up of smaller words that we’re calling word parts. It also helps that when a new term not practiced previous to reading is encountered in the reading at least the word parts are recognized. This should make it easier and faster and more accurate going than having to read a new term letter by letter by letter. Kevin Patton: For example, take carbaminohemoglobin. Please, take it. No, actually I love that word. My students will tell you this. I say it all the time just because I like saying it. Carbaminohemoglobin there has been on the short list of possible baby names for all three of my children and I’ve suggested it for several pets. Someday folks. Someday I’ll be introducing you to my pet sea monkey [Carvey 00:16:21]. Anyway, carbaminohemoglobin is a load of fun to say out loud which is why I worked it into this podcast episode, but alas it’s also intimidating for students the first time they see it. Kevin Patton: However, if they’ve already been practicing the use of terms with word parts like carb and amino and hemo and globin and possibly using combinations of those word parts already like hemoglobin, then it’ll be easier for them when they encounter it for the first time, but if they actually say it out loud maybe several times so it really rolls off the tongue carbaminohemoglobin, carbaminohemoglobin, then they’ll really be ready for some efficient and useful reading. When they get to that section of reading explaining how carbon dioxide is loaded into the blood and carried along, they won’t be stumbling all over the long complex term. Wait for it. Carbaminohemoglobin. They’ll already own the word. Kevin Patton: Once they own the word this way, that is once they can recognize it on site and don’t stumble over the pronunciation, then they’re all set to effectively learn what the word does. That is what concept it represents. They won’t have the cognitive load of trying to wrestle with a convoluted term while at the same time trying to figure out the biochemical concepts of carbon dioxide linking up with hemoglobin, how that fits into the big picture of blood gas transport. Kevin Patton: I always provide a word list with new terms in each chapter. In fact, I put them into my textbook so that any A&P student can use them. My chapter word list also provide pronunciation keys to help them with owning each term each. Each word list also includes word parts that reinforce the recognition of all those roots and suffixes and prefixes that we commonly encounter in the terminology of A&P to make reading newly encounter terms that much more efficient and to make comprehension more likely to occur. Kevin Patton: What if a student doesn’t have such a word list available? Well, that’s okay. As I said before, they can skim the chapter before reading it looking for boldfaced terms or any unfamiliar words the standout for them. At each one, they can pause and say it out loud a few times until they feel comfortable with the term at least a little bit comfortable with it. I know, I know it seems like a lot more work than simply reading the chapter cold, but the thing is, reading a chapter cold may be wasted time and energy if the comprehension isn’t happening. Using this pre-reading strategy may actually save time in the long run because it’s going to make the reading meaningful and it’s going to ramp up what the student learns as they read. Kevin Patton: It’s my belief that if we share these tips with students, it will help them get it far more easily than if they’re trying to read the textbook without a reading strategy. Even students who are already good readers benefit from this approach. Heck, even professors can benefit from this approach. I use this approach sometimes when I’m encountering a journal article or something like that in a topic that I’m unfamiliar with or that includes a lot of new terminology that I don’t typically use. I’ll skim through and trying to pronounce out loud some of those terms and then go back in and read that article for comprehension than is for its content. If you want to know more about this, check out the links in the show notes or the episode page for this podcast. I’ll talk to you next time. Kevin Patton: One more thing before I let you go. It’s summer time as I record this and a lot of us have a little bit different schedule in the summer than we have the rest of the year during the traditional academic year. We might be doing more traveling or more goofing around or whatever and those are good times to listen to a podcast on your mobile device. If you’re doing that, I invite you to go back to the beginning of this podcast series and listen to some of those early episodes, because I do occasionally refer back to those topics and a lot of folks have told me that they’ve gotten a lot out of what was shared in those early episodes. Kevin Patton: So, if you started somewhere in the middle and move forward from there or maybe this is the first episode you’re listening to, I really encourage you to go back and start at episode one and travel through it. It won’t take you that long. If you’re going to binge listen, they won’t take you long to get through them. This is episode 20 and they’re only maybe a half hour apiece so 10 hours. Boy, that’s a short binge, isn’t it? Okay, thanks a lot and really I’m going to let you go this time. Aileen: The A&P Professor is hosted by Kevin Patton, professor, blogger, and text author in human anatomy and physiology. Kevin Patton: This podcast may cause drowsiness. Please use care when operating machinery.